20. you can take it with you. It was the last thing I did inside Ohio Stadium when I left after Saturday’s cold, rainy loss to Michigan State. And it was the best way for me to start Michigan week. Those concrete garlands – they’re “strung” all around the stadium, attached to the building’s original façade – are my connection between the current, expanded version of the stadium and the one that my grandfather worked on before it opened in 1922. I’m not especially superstitious, but I always make sure I go up the correct stairway to C Deck so I can touch one of those garlands. It’s a little thing, but it makes me feel like I have the entire weight of Ohio State football history behind me as I climb up to my seats. The renovations to the stadium were completed in the early 2000s, and they added capacity to the building in two ways: the track was removed and the field was lowered, so additional seats could be added to the base of the lower bowl, and a new façade was erected outside the old one so C Deck could be expanded up an out. I don’t recall the first time I touched one of the garlands, but once I settled on that as a tradition, I’ll even backtrack down a second flight of stairs just to make sure I touch one before the game begins. 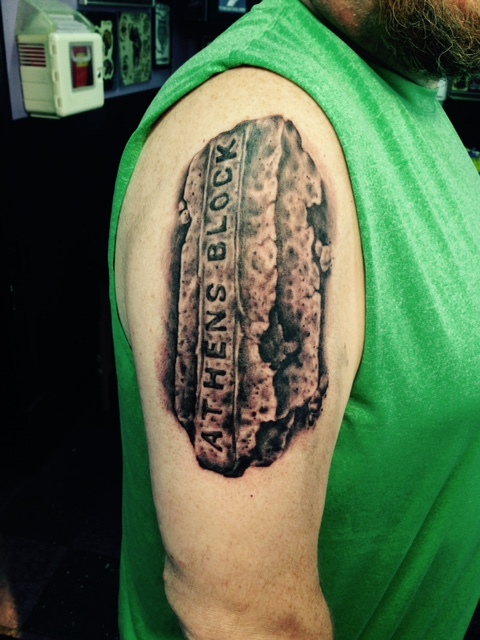 As you may be aware, I got my first tattoo last spring, a subtle – in theme, not in the size of the piece – display of my affection for Athens. Something having to do with Ohio State football was a natural for Tattoo No. 2, but getting a Block O or something else obvious just wasn’t going to work. But while struggling with potential ideas, Mrs. Crappy made a suggestion: What about those garlands? I immediately thought they would work as a bicep band. So about a week after my birthday, I went back to see Erin at Kyklops. Once again she totally nailed what I had in mind. And although there won’t be another trip to Ohio Stadium during the 2015 season, I will have a little bit of the stadium with me all the way through Michigan week. After thinking of a few possibilities, she said it was a tattoo. Hmmmm. I considered a few possibilities … A big U of M “M” with a screw going into it … the scores of the Wisconsin, Alabama and Oregon games … and my fave: a tank with the gun blazing with a pithy slogan like “Guts. Glory. Tanks.” or perhaps “Give War A Chance”. Then she said it was a brick from Athens. Perfect, I thought, a tribute to the ancient writer/philosophers like Plato and Socrates. Then she said it was Athens, OHIO. Hmmmm. Why not? 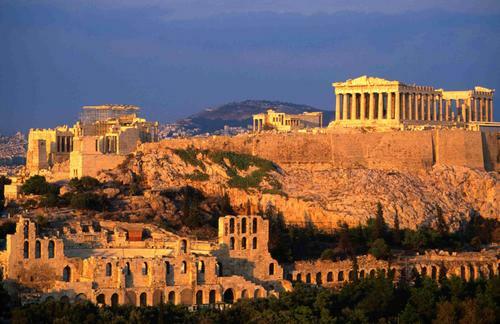 You love Athens and OU. I think it is cool. I came very close to getting a small USMC tat … one less person in line at the parlor at Oceanside and I probably would have one. And now I’m thinking about a tattoo of Plato. Hmmmm. 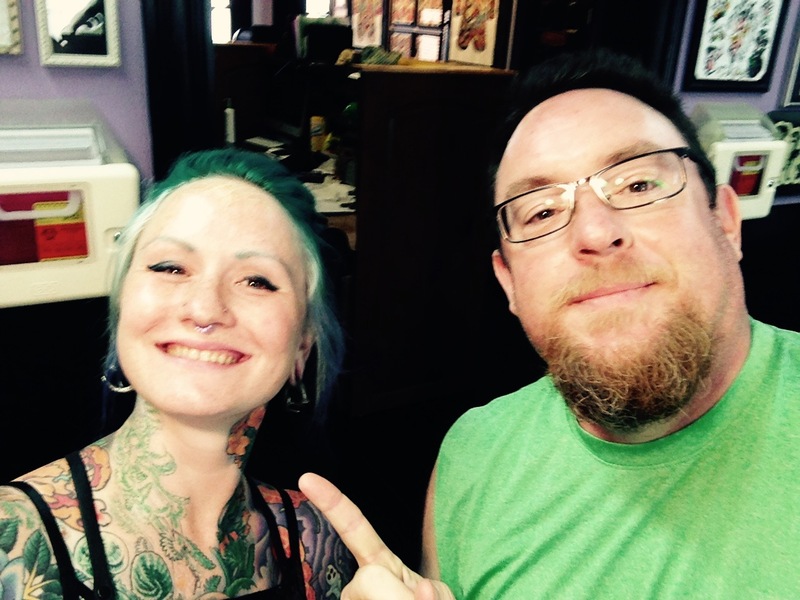 As mid-life crises go, getting a tattoo is way less expensive than a sports car. And when you’re working with a print-journalism salary, that’s kind of an important thing to consider. But once that decision is made, you’re faced with another: What’s the tattoo going to be? I’ve known for several years that I wanted to get one, and I realized late last year that I didn’t care to follow the original plan, which was to get one in observance of my 50th birthday. Nope. Not waiting. But then — what’s it going to be? Ohio related? Yes. Something football? Nah, that’s too easy. A design featuring the state’s borders? I’d never come up with one as cool as Bethany’s. Something related to OU? That’s closer, but still — a green paw print didn’t seem distinctive enough, and I wanted something to emphasize Athens rather than the university. And then I came to the things that have always served as my favorite icon of the town that still feels like my spiritual home, the thing that we’ve given to friends as wedding presents and that we’ve used as decoration around our apartments and houses. They’re pretty much ubiquitous in town and, since I left town, they’ve even spawned a merchandise line. If you’ve lived in Athens, these will look familiar. They pave the main streets Uptown, and you don’t have to look hard around the rest of town to find them (like, say, in the lightly traveled alley across the street from my apartment on West State at Shafer — which is definitely NOT the source of Athens Block bricks I’ve relied on for several years. Ahem). 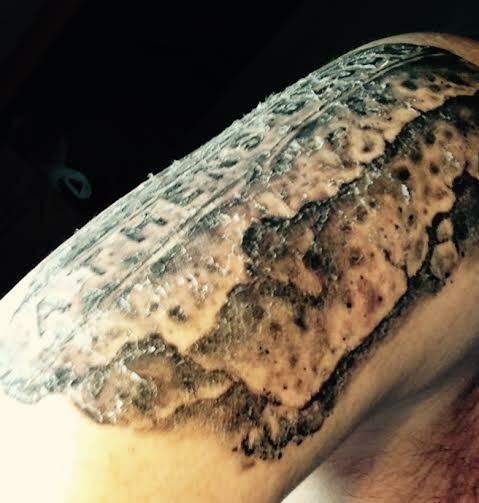 With that in mind, I set out to find a Pittsburgh artist who, based on a pretty vague description from me, could draw a convincing, detailed brick on my arm. And as it turned out, I didn’t have to look far — Erin at Kyklops was recommended to me by a couple different people, and because I knew her a little bit already, the decision was easy. Answers: No, it didn’t hurt, until Erin finished up with some detail stuff right at the end; beyond that, the physical part of getting a tattoo is just kind of annoying, an irritation. No, I was never concerned about getting one, not from the standpoint of any kind of risk (seeing the attention paid to cleanliness at Kyklops actually reminded me of being in a doctor’s office, with much more interesting stuff on the walls), and not from the standpoint that OH MY GOD YOU’RE GOING TO HAVE THAT ON YOUR BODY FOR THE REST OF YOUR LIFE — which is why I was certain about the design, the shop and the artist. And yes, I’m probably going to get more. A final word about Erin: She’s really good, and she’s fun to hang out with for a couple hours while she pokes at your skin. I will go back to her; if you’re in or around Pittsburgh and you’re looking for an artist, you should go see her too. In the last few months I went from having a vague notion that this would be something I’d do in a couple years to realizing that it was kind of dumb for me to wait this long. This is the kind of outward expression of who I am that I’ve always done — this version is just a little more permanent. It feels right to have this on my arm. And it will feel just as right to get a couple more.